Proof assistants (also called interactive theorem provers) are interactive tools with a graphical user interface that make it possible to develop computer-checked, formal proofs of theorems, usually expressed in some variant of higher-order (HO) logic. The primary advantage of formal proofs over their pen-and-paper counterparts is the high trustworthiness of the result; but increasingly, proof assistants are also used for their convenience, especially for program verification, where the proof obligations can be very large and unwieldy. Compared with other formal methods, the hallmark of proof assistants is their wide applicability and expressiveness. They have been employed since the 1990s for hardware and software verification at AMD and Intel. Some mathematical proofs, such as the four-color theorem and the Kepler conjecture, are so complex and require such massive computations that they could be fully trusted only after they had been conducted in a proof assistant. Vladimir Voevodsky, a leading homotopy theorist and Fields medalist, advocates the use of these systems as the only satisfactory answer to the unreliability of modern mathematics. In computer science, two recent groundbreaking developments are the C compiler CompCert verified using the Coq proof assistant, and the seL4 operating system microkernel, verified using Isabelle. CompCert is entering Airbus's tool chain because it generates trustworthy optimized code; without a formal proof, certification authorities would not condone the use of compiler optimizations. The seL4 microkernel was developed jointly with a formal proof that it meets its specification. By building on the verified kernel, it is now possible to design verified software chains, with formalized safety and security properties. There are ongoing projects in the automotive industry, aviation, space flight, and consumer devices based on seL4. So why is only a tiny fraction of software verified? There is a misconception that proof assistants can be mastered only by mathematical virtuosi, but this has been repeatedly refuted in practice. A much more serious issue that affects all users, whether novice or expert, is that proof assistants are very laborious to use. The formal verification of seL4 required about 20 person-years, compared with 2.2 person-years to develop the microkernel itself. To formalize one step in an informal mathematical argument, users must often introduce intermediate properties, interacting with the proof assistant through special commands called tactics. The need for users to engage in so many interactions—the lack of automation—stands out as the primary cause of low productivity. Sledgehammers and machine learning algorithms have led to visible success. Fully automated procedures can prove … 47% of the HOL Light/Flyspeck libraries, with comparable rates in Isabelle. These automation rates represent an enormous saving in human labor. When formalizing Gödel's incompleteness theorems, Lawrence Paulson estimated his improvement in productivity in a private communication as a "factor of at least three, maybe five"—an anecdotal but telling remark. Example While formalizing some results that depend on multisets, the principal investigator found himself needing the basic property |A| + |B| = |A ∪ B| + |A ∩ B|, where A and B range over finite multisets and | | denotes cardinality. Within 30 seconds, Sledgehammer produced a proof text invoking a suitable tactic with ten existing lemmas. Without Sledgehammer, proving the property could easily have taken 5 to 15 minutes, and even longer for a novice. Lost in translation: The translation from higher-order logic to the automatic provers' first-order logic relies on clumsy, incomplete encodings, often resulting in problems that are theoretically or practically unprovable. No induction: First-order provers generally cannot perform induction, a special case of higher-order reasoning, and the few that can support only a form of induction (structural induction on datatypes). Explosive search space: First-order provers perform a systematic, breadth-first search for a proof. They usually fail on interactive goals that require a long proof, even if the proof is straightforward to a human. First-order automatic provers are very useful, but they are greatly hampered by their lack of support for higher-order constructs. More research is necessary to combine the most successful first-order methods with strong higher-order reasoning. Higher-order reasoning has not yet assimilated the most successful first-order methods, namely superposition and SMT. The existing provers are designed for small and tricky higher-order problems, whereas typical proof goals are only mildly higher-order but large. Moreover, these provers do not support polymorphism, which is needed to reason about parameterized theories, and they usually fail to discover even trivial proofs by induction. Interactive theorem proving has grown considerably in recent years. Proof assistants are employed to build safety- and security-critical systems, and it is not uncommon for research papers to be accompanied by formal proofs. The memory models of Java and C++ have been mechanically verified. Proof assistants are even deployed in the classroom, replacing pen-and-paper proofs. These circumstances point to a future where these tools will be routinely used for critical computing infrastructure, for programming language design, and more broadly for research in computer science and mathematics—contributing to more reliable systems and science. But to make this a reality, we must take the hard, tedious labor out of interactive verification. Despite the success of Sledgehammer-style automation, interactive verification is rarely cost-effective. Much more ought to be done. A fundamental problem is that automatic provers and proof assistants are developed by two mostly disjoint communities, pursuing their own goals. Sledgehammer tries to compensate for the mismatch between these two worlds, but only so much can be done when using automatic provers as black boxes. A more radical approach is necessary for further progress. Our grand challenge is to create efficient proof calculi and higher-order provers that will target proof assistants and their applications to software and hardware development. High levels of automation will arise only by building on the strengths of both communities. Higher-order reasoning, including induction, really belongs in high-performance automatic provers. The principles underlying the tactics of proof assistants, largely based on higher-order rewriting, must be integrated into the proof calculi of automatic provers, to solve problems that require both higher-order rewriting and systematic search. Briefly, we want to enrich state-of-the-art automatic methods with concepts motivated by interactive verification. The first-order provers and calculi are sophisticated artifacts with fragile properties; combinations require careful theoretical and pragmatic considerations. The grand challenge will be met by pursuing four objectives, presented below. Our starting point is that first-order provers are the best tools available for performing most of the logical work. First-order provers, in turn, may delegate this work to SAT (satisfiability) solvers, in a game of Russian dolls. Most problems that are higher-order are only mildly so—a little higher-order can go a long way. Often, expanding definitions and normalizing λ-terms is all the higher-order reasoning that is needed; but the proof assistants are often too weak to carry out the remaining reasoning steps automatically, and first-order provers cannot manipulate the encoded λs efficiently. Typical proof goals arising in interactive verification are not very difficult, but they require a mixture of undirected proof search and long chains of straightforward reasoning. The past 25 years have seen the rise of superposition provers, SAT solvers, and SMT solvers. Most of the research on higher-order reasoning either predates these developments or fails to fully capitalize on them. Thanks to the wider adoption of proof assistants, we now have a clear idea of the kinds of goals arising in practice and can count on a huge body of relevant benchmarks (e.g., the Archive of Formal Proofs). On interactive goals, Sledgehammer is demonstrably superior to previous approaches to higher-order reasoning. Yet, its eager HO-to-FO translation views automatic provers as black boxes. Better performance will be possible if we open the black boxes and interleave FO and HO reasoning. Superposition and SMT are currently the most successful proof calculi for classical first-order logic. Despite some convergence, they remain very different technologies, with complementary strengths and weaknesses. The experience with Sledgehammer and similar tools is that many goals can be proved only with superposition or only with SMT. With multi-core processors being the norm, it is beneficial to let different kinds of provers run in parallel. Another reason for pursuing both approaches is that there might be synergies between higher-order reasoning and each calculus. The challenge is to preserve the desirable properties of the underlying first-order calculi—whether theoretical (soundness and completeness) or practical (effciency)—while extending them to perform higher-order rewriting and other higher-order reasoning. This is especially problematic for superposition. The calculus relies on a term ordering to prune the search space. 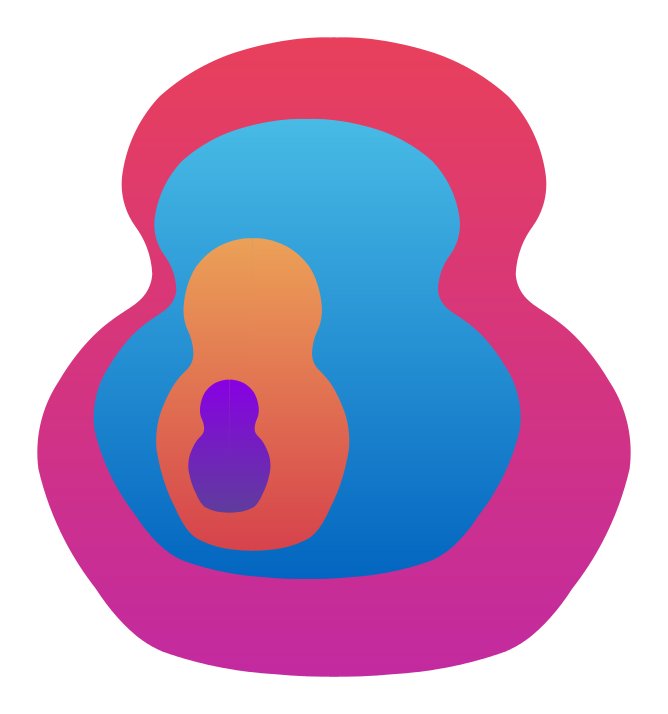 This has sometimes been seen as an insurmountable obstacle for the extension of superposition to higher-order logic, but we are confident that a λ-term ordering with the desired properties can be designed. Furthermore, recent work has shown that polymorphism, induction, and extensionality reasoning are compatible with superposition, all of which are desirable features of higher-order provers. Proofs about proof calculi tend to be quite tedious. For this reason, we plan to "eat our own dog food" and carry some of them out in a proof assistant. Our contributions will be part of the IsaFoL (Isabelle Formalization of Logic) repository. In the past decade, we have seen the emergence of higher-order provers based on a cooperative architecture. These are full-fledged provers that regularly invoke an external first-order prover as a terminal procedure, in an attempt to finish the proof quickly. The external prover may succeed if all the necessary higher-order instantiations have been performed. But because the less efficient higher-order part of the prover steers the search, this architecture leads to comparatively poor performance on problems with a substantial first-order component. We propose a radically different stratified architecture for higher-order provers, code-named Matryoshka. 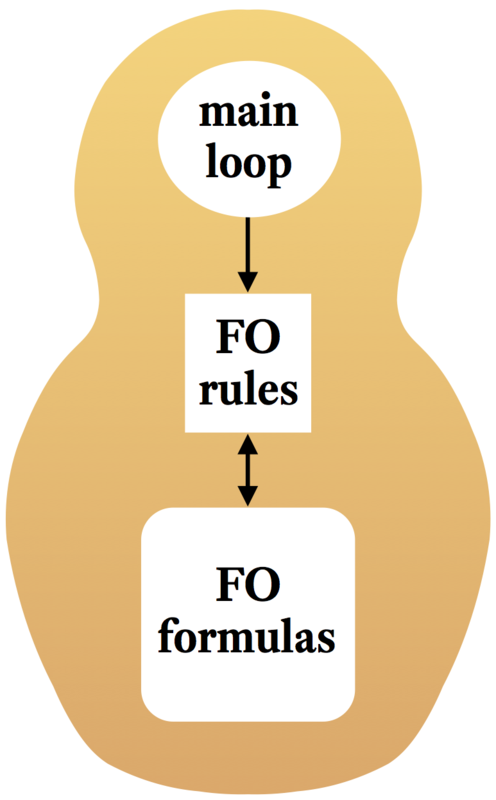 At an abstract level, a first-order prover combines three ingredients: (1) a collection of FO formulas derived so far; (2) a set of FO inference rules; and (3) a main loop that applies the rules to derive more formulas. Our envisioned architecture will extend this setup with (1') a collection of HO formulas and (2') HO inference rules that operate on all formulas and put any derived formula in the appropriate collection. The principal modification to the underlying first-order prover is to the main loop, which must interleave FO and HO rule applications. Unlike with the cooperative architecture, a Matryoshka prover is a single program, written in one language—typically, C or C++. 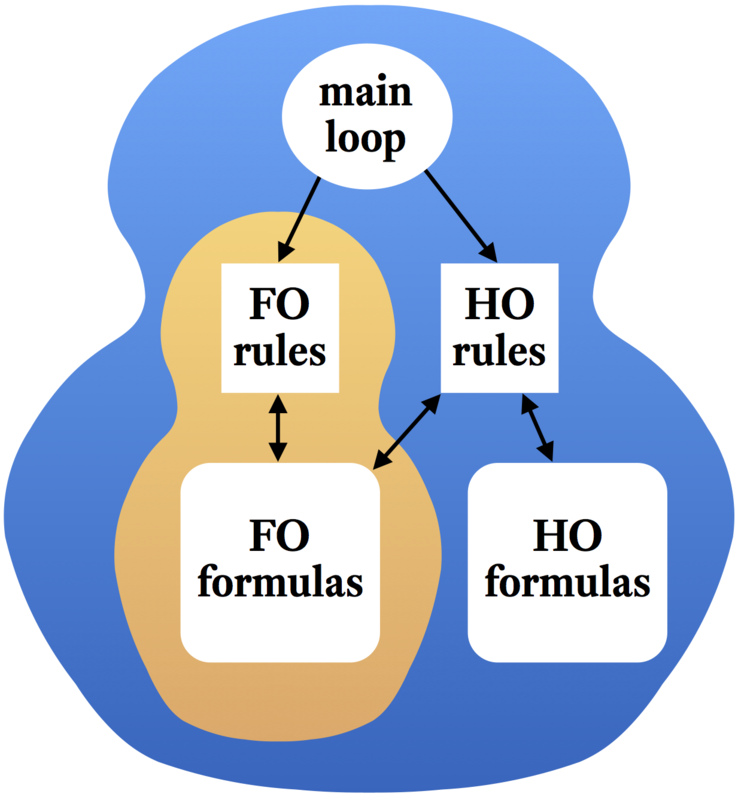 With this novel architecture, the automatic prover behaves exactly like a FO prover on FO problems, performs mostly like a FO prover on HO problems that are mostly first-order, and scales up to arbitrary HO problems, in keeping with the zero-overhead principle ("What you don't use, you don't pay for"). The architecture is reminiscent of the interaction between the SAT solver and quantifier instantiation inside an SMT solver, but there are many open questions because the two logics involved in a stratified higher-order prover are more expressive. The concrete results of this research project will include two higher-order superposition provers, based on Zipperposition and E, and a higher-order SMT solver, based on veriT. We will also collaborate with the developers of other provers, such as the superposition prover Vampire, the SMT solver CVC4, and the higher-order paramodulation prover Leo-III. We will develop high-level, technology-agnostic rules, heuristics, and strategies for instantiating higher-order variables (i.e., variables representing functions or formulas) and for reasoning about λ-terms, polymorphic types, (co)datatypes, (co)induction, and arithmetic. Moreover, first-order provers often fail because induction is necessary. Recent work on automating structural induction in superposition and SMT are welcome developments; but to reach its full potential, this work must be generalized to arbitrary induction schemas, including well-founded induction and rule induction. Codatatypes and coinduction, which are used in the metatheory of programming to model infinite traces or processes, are other examples of general, widely applicable theories that could be automated e ciently. Higher-order logic is also powerful enough to capture mathematical binder notations such as summations and integrals, which arise when studying quantitative properties of programs and protocols; automating these will have practical value in a variety of domains. It has been argued that to make further progress in automated reasoning, we must introduce a planning layer that governs the proving process at a higher level than proof calculi, performing plausible reasoning, emulating a human. Proof planning has not yet made a strong practical impact on interactive or automatic proving, but the time has come to revisit this idea in conjunction with machine learning, as part of this objective. Ultimately, the crucial question is whether our methods will bring substantial benefits to end users. Most of these will work with a proof assistant, which offers a convenient interface for controlling automatic provers and for performing manual proof steps when necessary. Thus, it will be vital to integrate our new stratified provers in proof assistants, by developing or extending Sledgehammer-like tools. We plan to target Coq, Isabelle/HOL, and the TLA+ Proof System, which cover the main higher-order formalisms in use today: dependent type theory, higher-order logic, and set theory. Coq and Isabelle/HOL are probably the two most popular proof assistants, with hundreds of users. Coq's native automation is weaker than Isabelle's, and there is no equivalent to Sledgehammer. As for the TLA+ Proof System, it is a newer tool for verifying concurrent and distributed systems based on Leslie Lamport's Temporal Logic of Actions, with potential in industry. 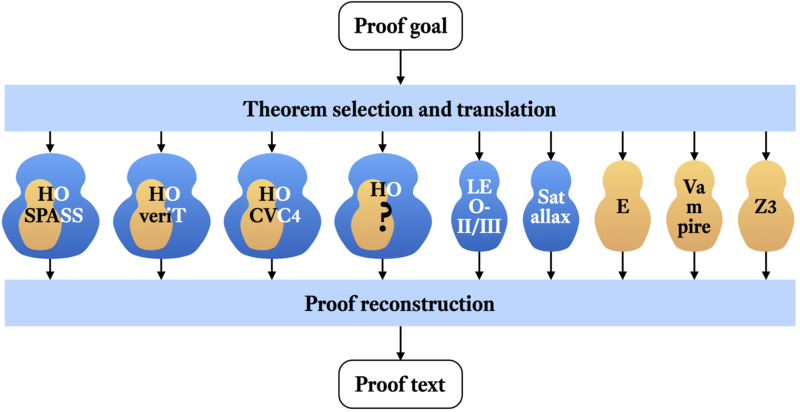 The proofs generated by the new provers will be translated, or "reconstructed," to yield self-contained Coq, Isabelle/HOL, and TLA+ proof texts. Automated reasoning requires highly optimized data structures and algorithms, written in an imperative language. A separation of concerns means that the same automatic provers can be shared across many proof assistants. We contend that too much work has gone into engineering the individual proof assistants, and too little into developing compositional methods and tools with a broad applicability across systems. The project is thankful for the support and advice of the following friends and colleagues: Jeremy Avigad, Jean-Pierre Banâtre, Peter Boven, Chad Brown, Jip Chong, Fabienne Elbar, Wan Fokkink, Carsten Fuhs, Kris de Jong, Cezary Kaliszyk, Steve Kremer, Mojca Lovrenčak, Leonardo de Moura, Anja Palatzke, Lawrence Paulson, Francis Petitjean, Sylvain Petitjean, Andrei Popescu, Femke van Raamsdonk, Trenton Schulz, Mark Summerfield, Nicolas Tabareau, Susanti Tang-Budiwandojo, Dmitriy Traytel, Josef Urban, Caroline Waij, and Paul Zimmermann. Sander R. Dahmen, Johannes Hölzl, and Robert Y. Lewis. Haniel Barbosa, Andrew Reynolds, Daniel El Ouraoui, Cesare Tinelli, and Clark Barrett. Alexander Bentkamp, Jasmin Blanchette, Sophie Tourret, Petar Vukmirovi&cacute;, and Uwe Waldmann. Paula Chocron, Pascal Fontaine, and Christophe Ringeissen. Accepted in Journal of Automated Reasoning. Haniel Barbosa, Jasmin Christian Blanchette, Mathias Fleury, and Pascal Fontaine. Accepted in Journal of Automated Reasoning. Alexander Bentkamp, Jasmin Christian Blanchette, and Dietrich Klakow. Accepted in Journal of Automated Reasoning. Petar Vukmirovi&cacute;, Jasmin Christian Blanchette, Simon Cruanes, and Stephan Schulz. In Vojnar, T., Zhang, L. (eds.) 25th International Conference on Tools and Algorithms for the Construction and Analysis of Systems (TACAS 2019), LNCS, Springer, 2019. Haniel Barbosa, Jasmin Christian Blanchette, Mathias Fleury, Pascal Fontaine, and Hans-Jörg Schurr. In Hales, T. C., Kaliszyk, C., Kumar, R., Schulz, S., Urban, J. (eds.) 4th Conference on Artificial Intelligence and Theorem Proving (AITP 2019). Jasmin Christian Blanchette, Daniel El Ouraoui, Pascal Fontaine, and Cezary Kaliszyk. In Hales, T. C., Kaliszyk, C., Kumar, R., Schulz, S., Urban, J. (eds.) 4th Conference on Artificial Intelligence and Theorem Proving (AITP 2019). Robert Y. Lewis. In Mahboubi, A., Myreen, M. O. (eds.) 8th ACM SIGPLAN International Conference on Certified Programs and Proofs (CPP 2019), pp. 15–26, ACM, 2019. Anders Schlichtkrull, Jasmin Christian Blanchette, and Dmitriy Traytel. In Mahboubi, A., Myreen, M. O. (eds.) 8th ACM SIGPLAN International Conference on Certified Programs and Proofs (CPP 2019), pp. 152–165, ACM, 2019. Jasmin Christian Blanchette. In Mahboubi, A., Myreen, M. O. (eds.) 8th ACM SIGPLAN International Conference on Certified Programs and Proofs (CPP 2019), pp. 1–13, ACM, 2019. Jasmin Christian Blanchette, Lorenzo Gheri, Andrei Popescu, and Dmitriy Traytel. 46th ACM SIGPLAN Symposium on Principles of Programming Languages (POPL 2019). Roy Overbeek. Archive of Formal Proofs, 2019. Anders Schlichtkrull, Jasmin Christian Blanchette, and Dmitriy Traytel. Archive of Formal Proofs, 2018. Roy Overbeek. MSc thesis, Vrije Universiteit Amsterdam, 2018. Hans-Dieter A. Hiep. MSc thesis, Vrije Universiteit Amsterdam, 2018. Anders Schlichtkrull. PhD thesis, Technical University of Denmark, 2018. Alexander Bentkamp. Archive of Formal Proofs, 2018. Pascal Fontaine, Cezary Kaliszyk, Stephan Schulz, and Josef Urban. AI Communications 31(3), pp. 235–236, 2018. Pablo Le Hénaff. MSc internship report, École Polytechnique Paris, 2018. Jens Wagemaker. BSc thesis, Vrije Universiteit Amsterdam, 2018. Haniel Barbosa, Andrew Reynolds, Pascal Fontaine, Daniel El Ouraoui, and Cesare Tinelli. In Dimitrova, R., D'Silva, V. (eds. ), 16th International Workshop on Satisfiability Modulo Theories (SMT 2018). Jasmin Christian Blanchette, Nicolas Peltier, and Simon Robillard. In Galmiche, D., Schulz, S., Sebastiani, R. (eds.) 9th International Joint Conference on Automated Reasoning (IJCAR 2018), LNCS 10900, pp. 370–387, Springer, 2018. Alexander Bentkamp, Jasmin Christian Blanchette, Simon Cruanes, and Uwe Waldmann. In Galmiche, D., Schulz, S., Sebastiani, R. (eds.) 9th International Joint Conference on Automated Reasoning (IJCAR 2018), LNCS 10900, pp. 28–46, Springer, 2018. Anders Schlichtkrull, Jasmin Christian Blanchette, Dmitriy Traytel, and Uwe Waldmann. In Galmiche, D., Schulz, S., Sebastiani, R. (eds.) 9th International Joint Conference on Automated Reasoning (IJCAR 2018), LNCS 10900, pp. 89–107, Springer, 2018. Jeremy Avigad, Jasmin Christian Blanchette, Gerwin Klein, Lawrence Paulson, Andrei Popescu, and Gregor Snelting. Journal of Automated Reasoning 61(1–4), pp. 1–8, 2018. Jasmin Christian Blanchette, Mathias Fleury, Peter Lammich, and Christoph Weidenbach. Journal of Automated Reasoning 61(1–4), pp. 333–365, 2018. Anders Schlichtkrull, Jasmin Christian Blanchette, Dmitriy Traytel, and Uwe Waldmann. Archive of Formal Proofs, 2018. Andrew Reynolds, Haniel Barbosa, and Pascal Fontaine. In Beyer, D., Huisman, M. (eds.) 24th International Conference on Tools and Algorithms for the Construction and Analysis of Systems (TACAS 2018), Part II, LNCS 10806, pp. 112–131, Springer, 2018. Petar Vukmirovi&cacute;. MSc thesis, Vrije Universiteit Amsterdam, 2018. Mathias Fleury, Jasmin Christian Blanchette, and Peter Lammich. In Andronick, J., Felty, A. P. (eds.) 7th ACM SIGPLAN International Conference on Certified Programs and Proofs (CPP 2018), pp. 158–171, ACM, 2018. Jasmin Christian Blanchette, Andrei Popescu, and Dmitriy Traytel. Archive of Formal Proofs, 2018. Andreas Fellner, Pascal Fontaine, and Bruno Woltzenlogel Paleo. Formal Methods in System Design 51(3), pp. 533–544, 2017. Jeremy Avigad, Johannes Hölzl, and Luke Serafin. Journal of Automated Reasoning 59(4), pp. 389–423, 2017. Daniel El Ouraoui. MSc internship report, Université Paris Diderot, 2017. Haniel Barbosa, Jasmin Christian Blanchette, Simon Cruanes, Daniel El Ouraoui, and Pascal Fontaine. In Dubois, C., Woltzenlogel Paleo, B. (eds.) 5th Workshop on Proof eXchange for Theorem Proving (PxTP 2017), pp. 15–22, EPTCS 262, 2017. Jasmin Christian Blanchette, Pascal Fontaine, Stephan Schulz, and Uwe Waldmann. In Reger, G., Traytel, D. (eds.) 1st International Workshop on Automated Reasoning: Challenges, Applications, Directions, Exemplary Achievements (ARCADE 2017), pp. 16–23, EPiC 51, EasyChair, 2017. Pascal Fontaine, Mizuhito Ogawa, Thomas Sturm, and Xuan Tung Vu. In Dixon, C., Finger, M. (eds.) 11th International Symposium on Frontiers of Combining Systems (FroCoS 2017), LNCS 10483, pp. 189–206, Springer, 2017. Simon Cruanes. In Dixon, C., Finger, M. (eds.) 11th International Symposium on Frontiers of Combining Systems (FroCoS 2017), LNCS 10483, pp. 172–188, Springer, 2017. Julian Biendarra, Jasmin Christian Blanchette, Aymeric Bouzy, Martin Desharnais, Mathias Fleury, Johannes Hölzl, Ondřej Kunčar, Andreas Lochbihler, Fabian Meier, Lorenz Panny, Andrei Popescu, Christian Sternagel, René Thiemann, and Dmitriy Traytel. In Dixon, C., Finger, M. (eds.) 11th International Symposium on Frontiers of Combining Systems (FroCoS 2017), LNCS 10483, pp. 3–21, Springer, 2017. Jasmin Christian Blanchette, Mathias Fleury, and Dmitriy Traytel. In Miller, D. (ed.) 2nd International Conference on Formal Structures for Computation and Deduction (FSCD 2017), LIPIcs 84, pages 11:1–11:18, Schloss Dagstuhl—Leibniz-Zentrum für Informatik, 2017. Alexander Bentkamp, Jasmin Christian Blanchette, and Dietrich Klakow. In Ayala-Rincon, M., Muños, C. A. (eds.) 8th Conference on Interactive Theorem Proving (ITP 2017), LNCS 10499, pp. 46–64, Springer, 2017. Jasmin Christian Blanchette, Mathias Fleury, and Christoph Weidenbach. In Sierra, C. (ed.) 26th International Joint Conference on Artificial Intelligence (IJCAI-17), pp. 4786–4790, ijcai.org, 2017. Simon Cruanes. In de Moura, L. (ed.) 26th International Conference on Automated Deduction (CADE-26), LNCS 10395, pp. 114–129, Springer, 2017. Haniel Barbosa, Jasmin Christian Blanchette, and Pascal Fontaine. In de Moura, L. (ed.) 26th International Conference on Automated Deduction (CADE-26), LNCS 10395, pp. 398–412, Springer, 2017. Heiko Becker, Jasmin Christian Blanchette, Uwe Waldmann, and Daniel Wand. In de Moura, L. (ed.) 26th International Conference on Automated Deduction (CADE-26), LNCS 10395, pp. 432–453, Springer, 2017. Daniel Wand. PhD thesis, Universität des Saarlandes, 2017. Jasmin Christian Blanchette, Fabian Meier, Andrei Popescu, and Dmitriy Traytel. 32nd Annual IEEE Symposium on Logic in Computer Science (LICS 2017), pp. 1–12, IEEE Computer Society, 2017. Haniel Barbosa, Pascal Fontaine, and Andrew Reynolds. In Legay, A., Margaria, T. (eds.) 23rd International Conference on Tools and Algorithms for the Construction and Analysis of Systems (TACAS 2017), Part II, LNCS 10206, pp. 214–230, Springer, 2017. Jasmin Christian Blanchette, Uwe Waldmann, and Daniel Wand. In Esparza, J., Murawski, A. S. (eds.) 20th International Conference on Foundations of Software Science and Computation Structures (FoSSaCS 2017), LNCS 10203, pp. 461–479, Springer, 2017. Jasmin Christian Blanchette, Aymeric Bouzy, Andreas Lochbihler, Andrei Popescu, and Dmitriy Traytel. In Yang, H. (ed.) 26th European Symposium on Programming (ESOP 2017), LNCS 10201, pp. 111–140, Springer, 2017. Alexander Bentkamp, Jasmin Christian Blanchette, and Dietrich Klakow. In Hales, T. C., Kaliszyk, C., Schulz, S., Urban, J. (eds.) 2nd Conference on Artificial Intelligence and Theorem Proving (AITP 2017), pp. 22–23. Andrew Reynolds and Jasmin Christian Blanchette. Journal of Automated Reasoning 58(3), pp. 341–362, 2017. Jasmin Christian Blanchette, Andrei Popescu, and Dmitriy Traytel. Journal of Automated Reasoning 58(1), pp. 149–179, 2017. Jasmin Christian Blanchette, Andrei Popescu, and Dmitriy Traytel. Archive of Formal Proofs, 2017. Alexander Bentkamp. MSc thesis, Universität des Saarlandes, 2016. Jasmin Christian Blanchette, Mathias Fleury, and Dmitriy Traytel. Archive of Formal Proofs, 2016. Heiko Becker, Jasmin Christian Blanchette, Uwe Waldmann, and Daniel Wand. Archive of Formal Proofs, 2016. Alexander Bentkamp. Archive of Formal Proofs, 2016. Jasmin Christian Blanchette, Uwe Waldmann, and Daniel Wand. Archive of Formal Proofs, 2016. Michaël Noël Divo. MSc thesis, Universität des Saarlandes, 2016. Please contact Jasmin Blanchette and Pascal Fontaine. for inquiries related to the project. The #Matryoshka stream of the Zulip chat room Sneeuwbal and the matryoshka-devel mailing list are used by the Matryoshka team for discussions. You can browse the mailing list archives or subscribe to it. The project's official music video: Matoryoshika by Hachi and Gumi.